If you have ever wanted to build your own furniture or home decor, I have a wonderful treat for you. 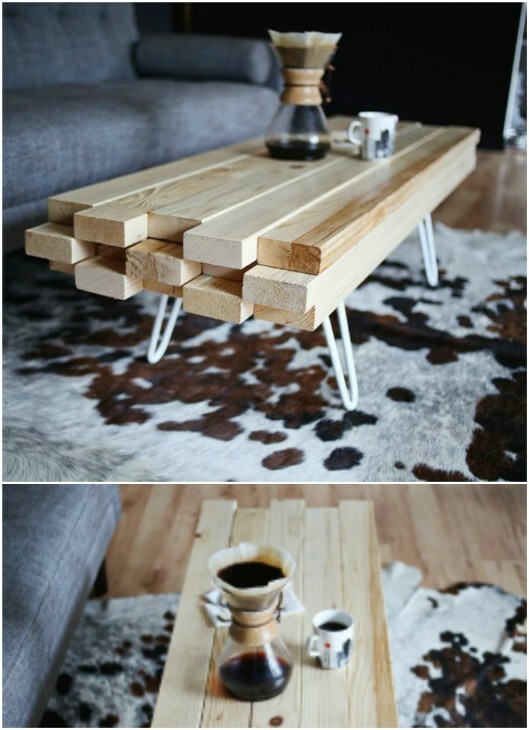 I’ve found 50 home decor and furniture ideas that you can make from 2X4s. The wonderful thing about this project list is you don’t have to have a lot of woodworking experience or expensive supplies to create beautiful pieces for your home. 2X4s are really cheap. In fact, they’re among the cheapest pieces of lumber that you can find. Head off to Lowe’s or your favorite home improvement store and you’ll find that these boards are only about $3 for an eight foot board. You can make so many wonderful things with those inexpensive boards, and I’m going to show you how. Many of these DIYs are so easy that you can do them in your spare time. Have a weekend free? You can build an outdoor couch, bench, or any number of console and coffee tables to add farmhouse rustic style to your home. In less than an hour, you can make wonderful holiday décor or some beautiful gifts for teachers and friends. I’m telling you, these projects are all super easy and they’re all so very inexpensive. 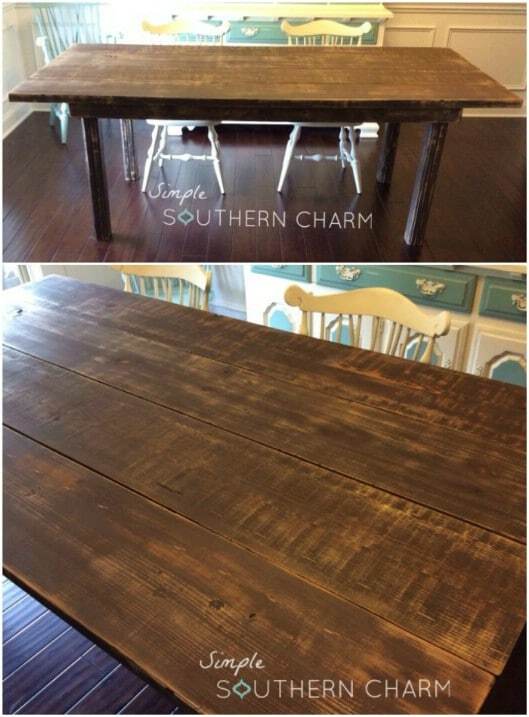 I love simple and cheap projects, and particularly when those projects end in rustic or farmhouse furnishings. Check out these 55 farmhouse furniture projects that you can make yourself. If you have a few 2X4s on hand, you can build so many wonderful things. Even if you don’t have any, they’re so cheap that you can justify driving to your local hardware store to pick up a few. I’ve even got a great workbench in here that you can make from those 2X4s to help you with your other woodworking projects. Some of these can also be made from reclaimed wood. I love reclaimed wood projects. Instead of throwing out those boards when you’re redoing cabinets or other renovations, you can turn them into new and exciting pieces for your home! If you’re into reclaimed wood projects, you should also check out these 40 eco-friendly reclaimed wood projects for the home. So, if you have ever wanted to make your own furniture or home décor, this is the perfect post for you to peruse. There is everything in here from stocking hangers and wood block snowmen to beautiful outdoor couches and even a wonderfully easy to build porch swing. From coffee tables to bathroom mirrors, there is always something that you can do with those 2X4s to make your home better and we’re going to take a look at 50 amazing ways for you to do just that. I hope you find as much inspiration in these DIY woodworking projects as I have! You can make these adorable stocking hangers from leftover 2X4 pieces from other projects. You just have to nail the two pieces together, add a hook for hanging the stocking, and then decorate they however you want. The wood pieces are relatively heavy so they’ll keep from topping over – fill those stockings as full as you want. And, this is a much cheaper way to get great stocking holders than paying $10 each for them. This charging station looks just like those expensive ones you see at department stores, but it will cost you much less. Actually, if you have a 2X4 on hand, it won’t cost you anything. You just need to cut a piece of your board, measure the hole that you need to fit your phone and then stain the board. You can build it to fit your phone no matter what type it is, so there are no worries of the phone not being secure while it’s charging. This wooden décor is gorgeous and a great way to show your love of family. You can obviously do whatever message you want on this, but I really love the Journey To Forever theme. 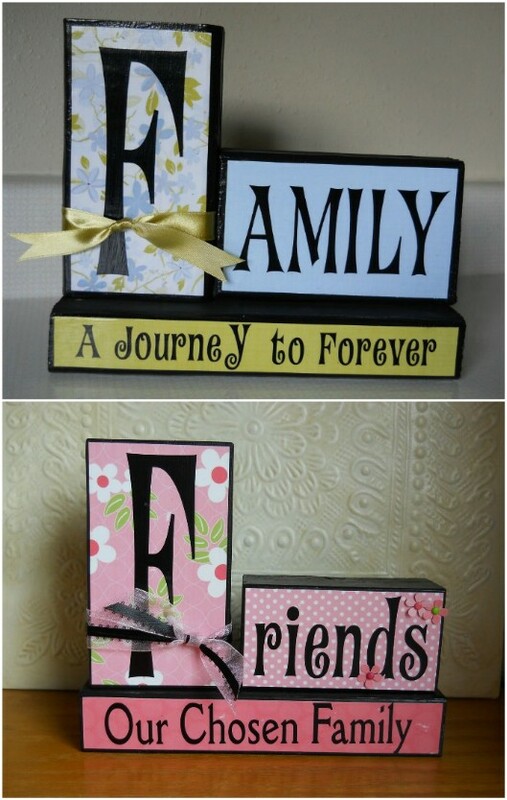 The blocks are all made from leftover 2X4 pieces and then you just paint and add your wording. Or, you can use scrapbook paper and adhere it to your blocks with Mod Podge. What a beautiful display for the mantel or coffee table! 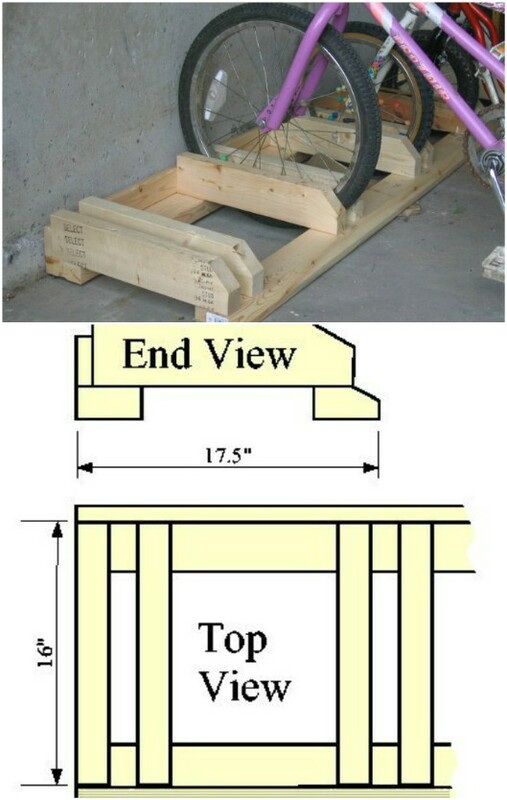 If you need a sawhorse for all of those woodworking projects, this is an easy one to build. You just nail your 2X4s together to create it and since those boards are a bit heavy, this little sawhorse is rock solid. You won’t have to worry about your boards slipping when you have them on here for sawing. 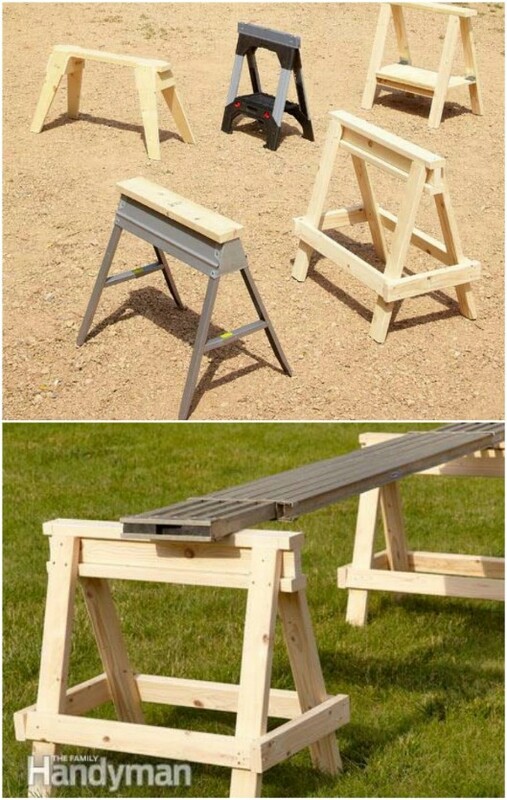 If you don’t have a sawhorse, and you don’t want to spend upwards of $50 to buy a pair, I strongly recommend this DIY project. Take those old 2X4s and put them to great use building this easy DIY bike rack. If you have kids, and those kids have bikes, you know how those bikes can be left out or topple over, getting in the way of everything. You can build this great basic bike rack in the garage, on the porch, or wherever you normally store your bikes. It keeps everyone’s bike separate and keeps them from falling over when they’re not in use. Plus, it’s a really easy build. 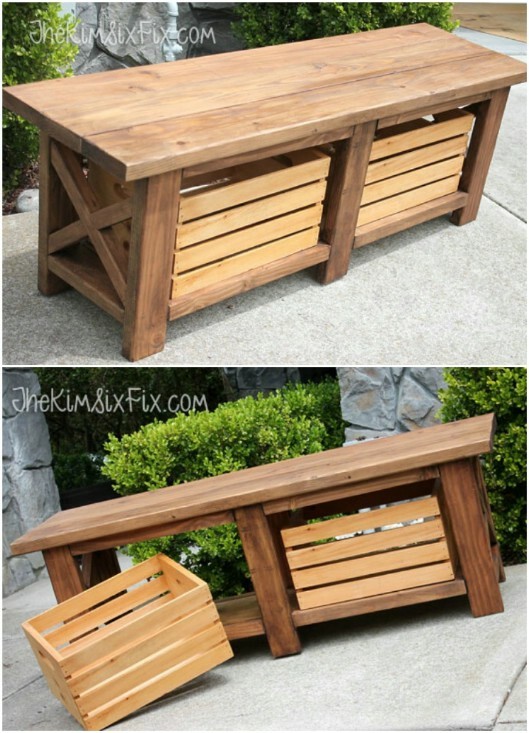 You can make this great outdoor bench and side table in a weekend. It’s the perfect piece of outdoor furniture for the deck or porch and it only takes a few 2X4s to complete. You don’t really even need to know that much about woodworking to build it. 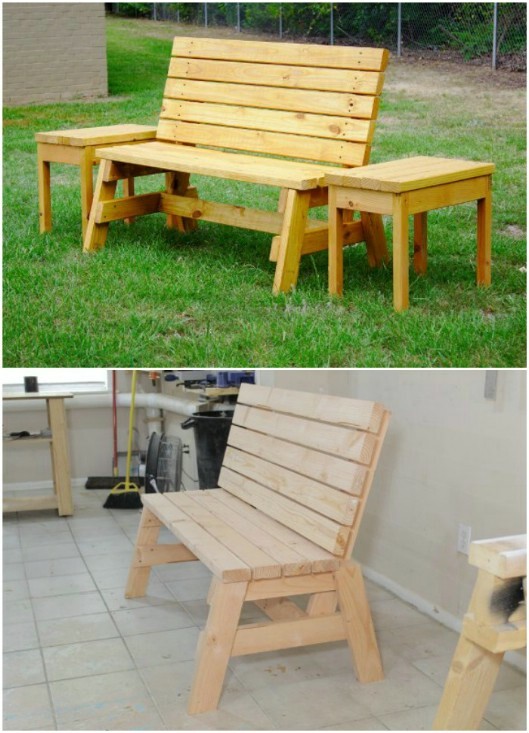 It’s pretty straightforward and simple and really is a wonderful bench for the backyard. If you’ve ever dreamed of having a farmhouse style bedroom, this 2X4 nightstand is a must. It’s such an easy little stand to build and it really does give off that great rustic country vibe. You only need three 2X4s to make it, too – and at less than $10 each, that’s way less than you would pay for a designer farmhouse nightstand. You can afford to put one on each side of the bed! If you tend to love woodworking projects, this workbench is certainly something that you should build. You can get all of the supplies you need to make it for around $20, which is much cheaper than buying an already made workbench. It’s cheap and nothing that you would expect to see in a high end workshop, but it’s also sturdy and definitely gets the job done. If you’ve ever done a woodworking project, you know that there are going to be scrap pieces of wood left over. You can turn those scrap 2X4 pieces into these lovely candle holders that fit a tealight candle perfectly. Just cut your candle holders all to the same size, use a drill bit to create the hole for the tealight candle and then sand and stain. Or, you can leave them plain if you prefer that great rustic look. This great floating shelf has a nice rustic quality to it. 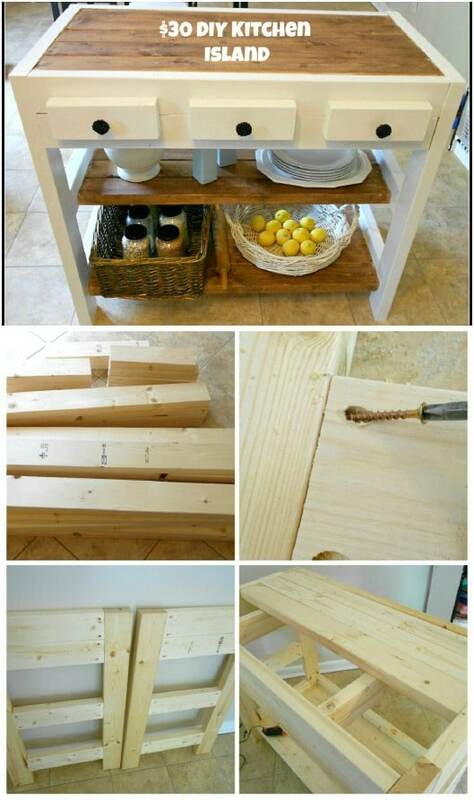 This little shelf is really easy to build and will only take you a couple of hours at the most. You can use it for a mantel if you don’t have one – imagine hanging your stockings from it! Once it’s finished, just stain however you want and maybe sand it down a bit to give it a great worn look. A few 2X4s and some other materials will net you this gorgeous rustic styled dresser. I love the crate style look. It gives off such a nice farmhouse vibe. If you’re planning to buy a new dresser, take a look at this one first. You can build it for much less than a new one would cost, especially when you build it in this beautiful rustic style. You only need a couple of 2X4s to build this beautiful farmhouse style entry table. You could also use this as a console – however you use it, you’re going to love the farmhouse quality. It’s such a simple rustic design and you can build the entire table, even if you don’t have any other materials, for $20 or less. Imagine having this amazing table for less than $20! 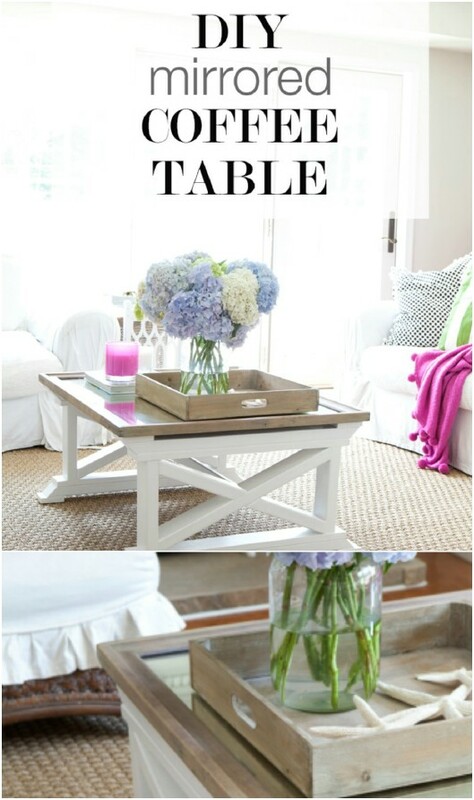 Add some beauty and charm to your dining room table and use up those scrap 2X4 pieces at the same time. This centerpiece is so easy to make and it is absolutely gorgeous when it’s finished. It’s just a little box that you build from your scrap 2X4 pieces. Once you stain it, and maybe distress it a bit, and add your vases, it transforms into a beautiful centerpiece that has a really nice rustic look to it. 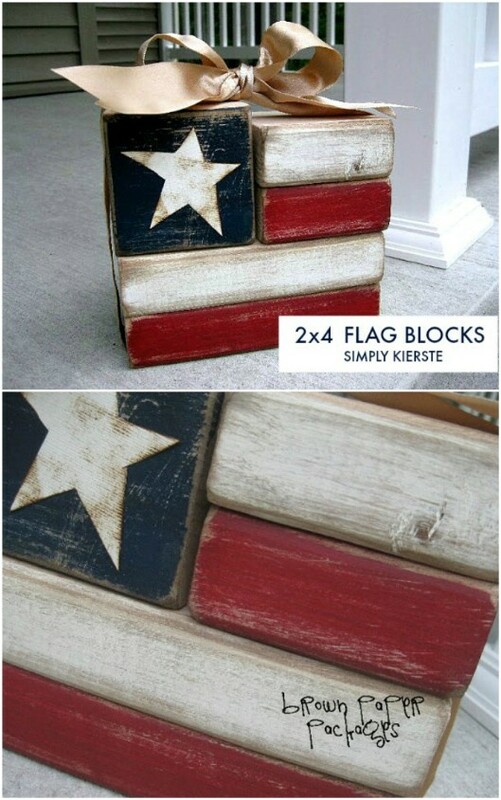 You can display these great flag blocks any time of the year, but they would be really great for the Fourth of July. 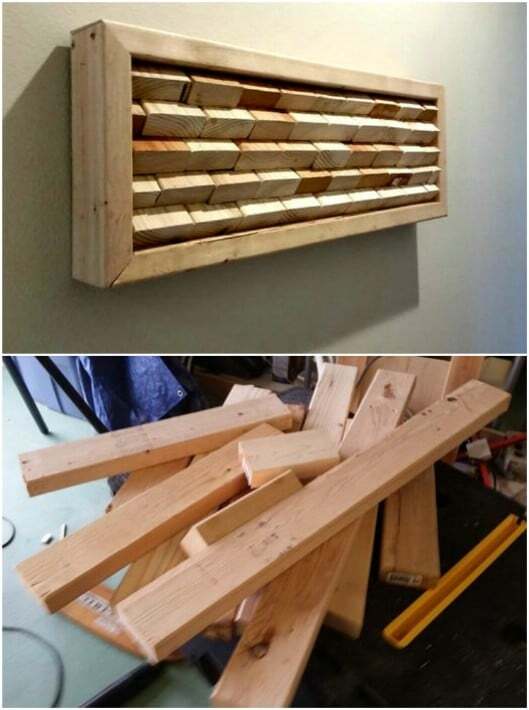 This is another project that only needs your scrap wood so if you’ve done other DIYs with your 2X4s and you just want something to use those scraps for, here’s a wonderful project. Just cut off the ends, sand them down, and paint them to resemble a flag. It’s an easy and absolutely beautiful project. 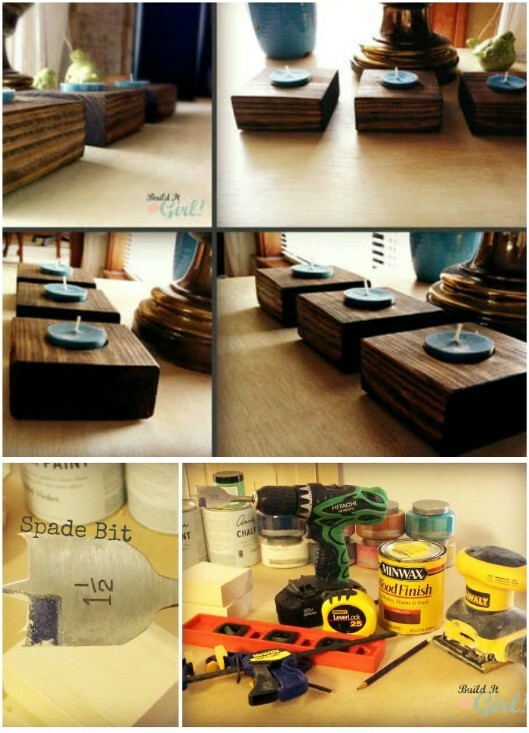 Here’s another wonderful DIY centerpiece idea that you can create with those leftover 2X4 pieces. This one has small holes all around the base that you can put bud vases in. Just fill those little vases with whatever flowers you want to display. You just put all the pieces together, drill the holes and then stain or paint. You can use test tubes for your vases and then just add your favorite blooms. This lamp has a really unique look and it’s perfect for any room in the house. You build the base, which is pretty high by the way, out of your 2X4s and then just add the lighting kit and a nice lampshade. You can make the lamp as short or as tall as you want or need, just cut those boards however long you need them before assembling it all together. Imagine having your friends and family over to play this life size Jenga game! This is probably the most fun project on this list and it really does look simple to make. Jenga after all, is merely a game of wooden boards that you strategically place and replace until someone wins, right? You can do that with your 2X4s and really cause some excitement at your next gathering. This is a great idea for those summer evenings when you want something fun and exciting to do in the backyard. I’ve always wanted to make my own barstools. I just can never seem to find the ones that I want, which is why I love this 2X4 project idea. You can make your own set of barstools with just a few boards and then paint or stain them however you need to so that they match your home décor. I love this idea for its uniqueness and for how really simple it is to do. I have a wine rack but it’s nowhere near as gorgeous as this one. Plus, mine doesn’t hang. This one hangs on the wall to keep it out of the way and it’s the simplest wine rack you will ever think about building. You just treat your wood however you want – stain, paint, etc. – and then drill holes, strategically placed of course, to hold your wine bottles. This is perfect if you need a wine rack but don’t really have room for something big and bulky. If you want something really unique from those 2X4s, build these hexagon wall planters. 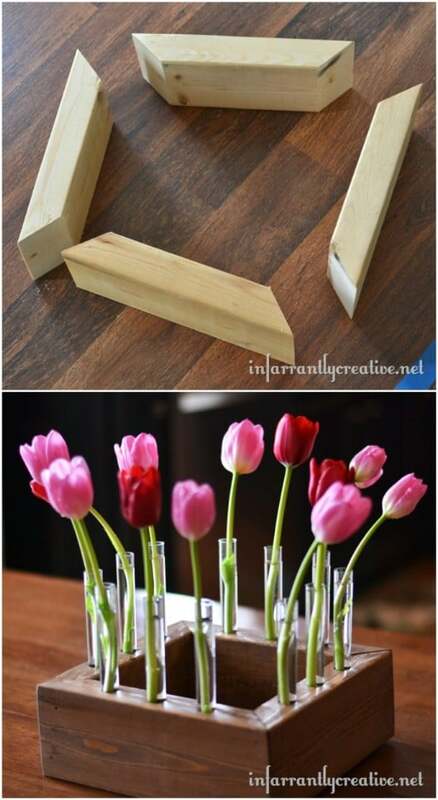 You cut strips of the 2X4 (you only need a couple of feet for each planter) and then assemble them to hold a mason jar. Inside the mason jar, you can put all sorts of fresh flowers or plants. These are so creative and will look beautiful hanging inside your home. 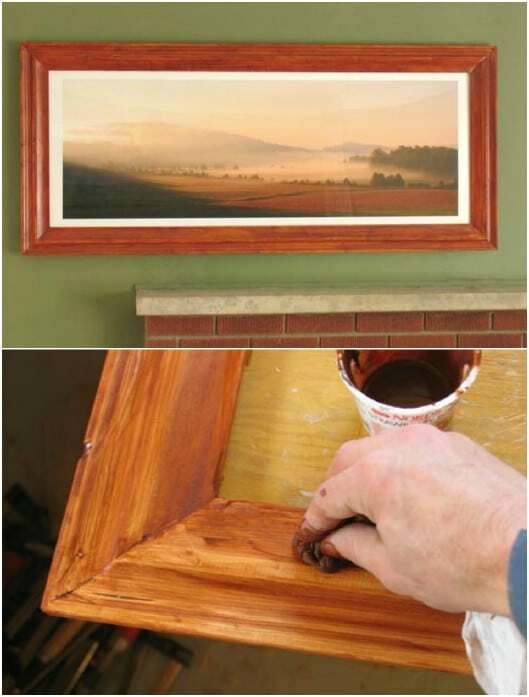 In just a few minutes, you can turn those 2X4s into beautifully rustic picture frames. These little frames are perfect for holding your most precious images and they are all so very easy to make. You can use those scrap pieces of board from other projects and create a frame that is perfect for gift giving. Make them as simple or as fancy as you like. You can buy one of these rustic crates for use in any number of DIY projects. They run around $10 or so each. Or, you can make one yourself from your 2X4s and they will cost you about $3 each. You’ll need some serious power tools for this one to cut the boards down to size and to round them off. Once you’re finished, you can use your wooden crate to create so many wonderful things! 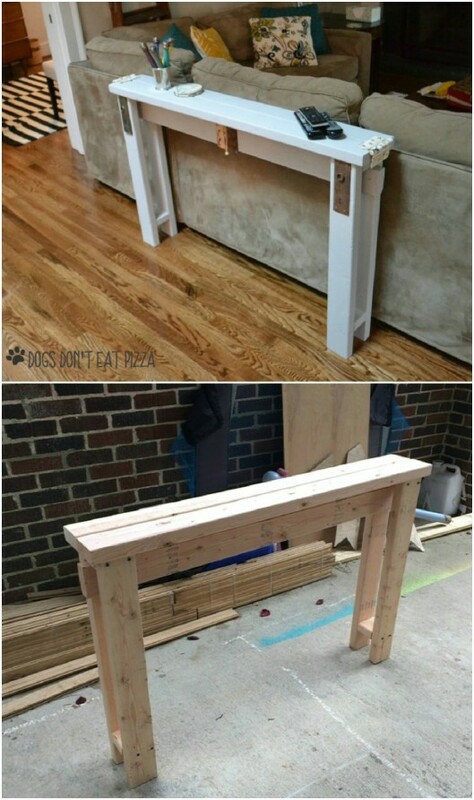 This little cart won’t take you long to make and it will be a great table for the hallway. If you love the industrial look, this is a great way to incorporate it into your home for less. If you prefer something a bit more farmhouse style, you can change the hardware and give it more of a country rustic look. Once it’s finished, use wicker baskets to hold loads of items. This would also be a great bathroom cabinet for extra towels if you have the room. 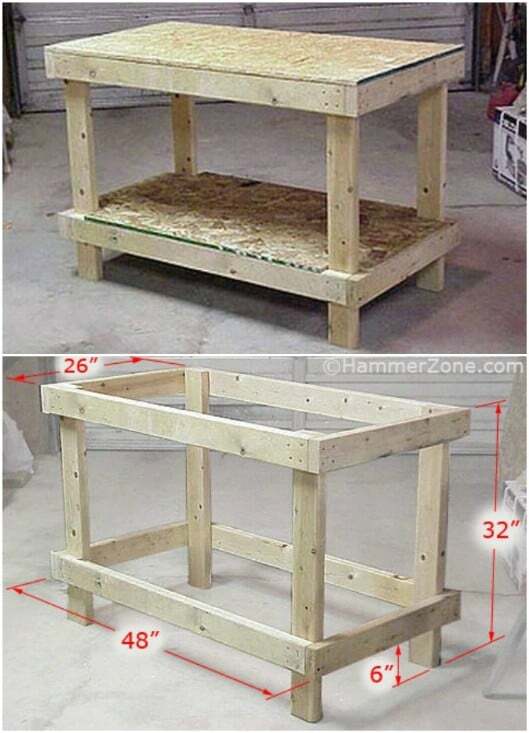 Did you know that you can build your own kitchen island for around $30? This wooden island made from 2X4s is not only beautiful, it’s also functional and so much cheaper than anything you can buy in a store. I love the rustic look of this, especially with the wood on white but you can do it in any color or design that you want. The point is, it’s really cheap and it’s the perfect island for any kitchen. 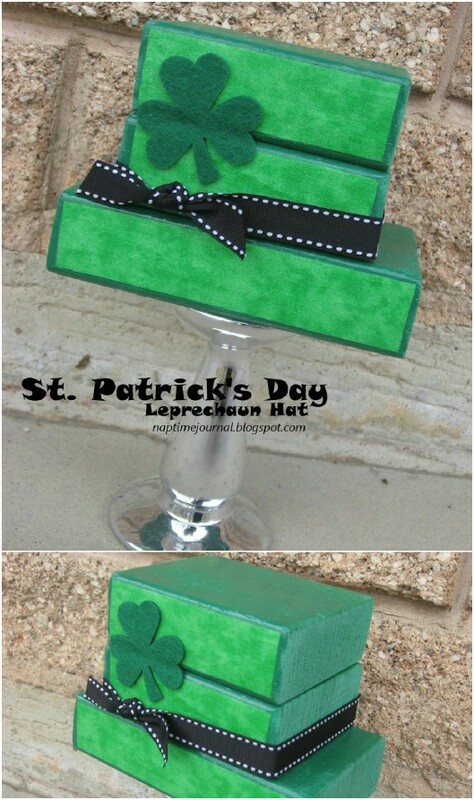 It may not be close to St. Patrick’s Day but that shouldn’t stop you from making this adorable little leprechaun’s hat. You can use it to decorate next year, and it’s made from leftover pieces of your 2X4. If you’re looking for a project to finish up those wood scraps, here it is. Just paint your wood pieces green and then stack them to make the hat. It’s easy and adorable! This mirrored coffee table is sure to be a great addition to your living room. It’s also a really easy project to build and the end result is absolutely stunning. You’ll need an old mirror, maybe from a dresser that you don’t need any longer. This one lets you use up some of those 2X4s and repurpose some old furniture at the same time. It should cost you less than $50 to make – as opposed to buying it in a furniture store for a couple hundred. My sofa table is one of my favorite pieces of furniture. If you don’t have one, you can easily make one from a couple of 2X4s. 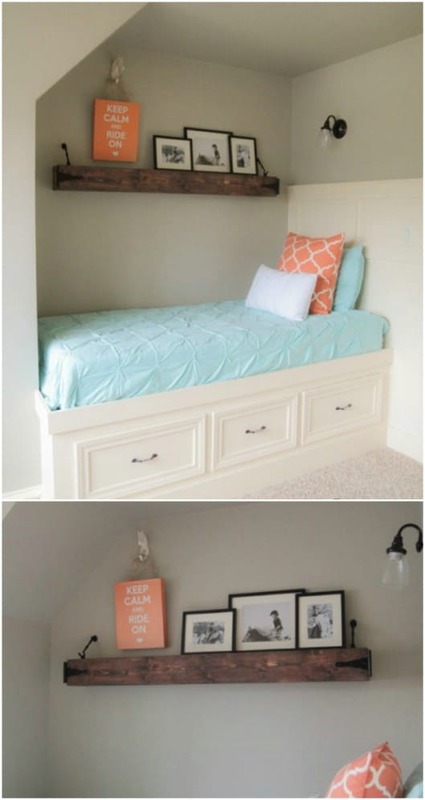 This makes a really narrow table that will perfectly fit behind your couch and not take up too much room. It’s great for holding candles or plants or you could use it as a mail and key holder table. If you’re looking for a way to instantly change how your bathroom looks, this DIY open shelf vanity that you may from 2X4s is a great start. I love the open shelf look for so many reasons. Those large baskets will perfectly hold your makeup and other toiletries and the shelves are great for keeping extra towels and other necessities right there at your fingertips. It’s also the perfect vanity if you like those bowl type sinks. Plus, this is an easy build – you can have it completed in just a few hours. This outdoor couch will take a few 2X4s – about 11 of them to be exact but at less than $10 each for the boards, it will still cost you less than anything you can get at a patio or furniture store. And, it’s a really sturdy couch. The best part? You can completely build this couch in less than four hours. Once you’ve finished, just add those homemade couch cushions and you’re all set to relax in the backyard. If you tend to do a lot of DIY projects, particularly with wood and the like, you’re probably going to want a great shelf to store all of those cans of paint. You don’t necessarily need something fancy, just big enough, right? Those 2X4s can be used to create a huge shelf that will leave you plenty of room for storing paint cans – or anything else that you need to store. This great pencil holder is perfect for your workbench. If you don’t have a workshop and just need something for the craft table or desk, you can totally cut this one down to size. This is the simplest pencil holder ever. You just measure out your 2X4, drill holes and then you’re all done. You could easily make shorter versions of this and paint or stain them to use on your desk. How great is this little Jeep? Whether you use this as a handmade toy or you want to display it, it’s a beautiful project and one that you can DIY! This one will take you a bit of time, but imagine how it will look displayed in your home. You can leave it plain for a rustic look or paint it however you want. If you’ve ever wanted to build your own Jeep – not one that you can drive obviously – this is the perfect 2X4 project. This plant stand is a really easy build and it looks so professionally done when it’s finished. 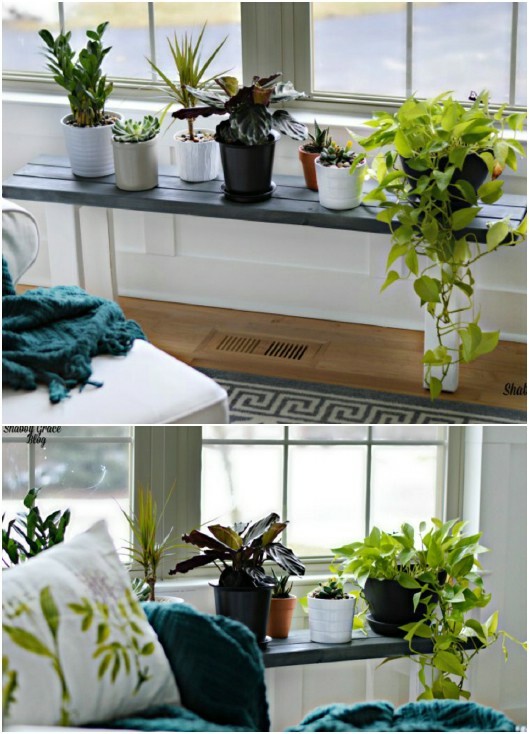 You can use this to display your favorite plants and keep them close to the window for the sunlight that they need. You need about four 2X4s and some other supplies to build it. It’s a pretty easy project – you can have it finished in just a couple of hours, including paint and stain time. And, it only costs around $10 to make. If you don’t have a porch swing, you are seriously missing out on some great relaxation. The problem with porch swings is that they can be really expensive. I’ve seen just basic swings sell for around $200. 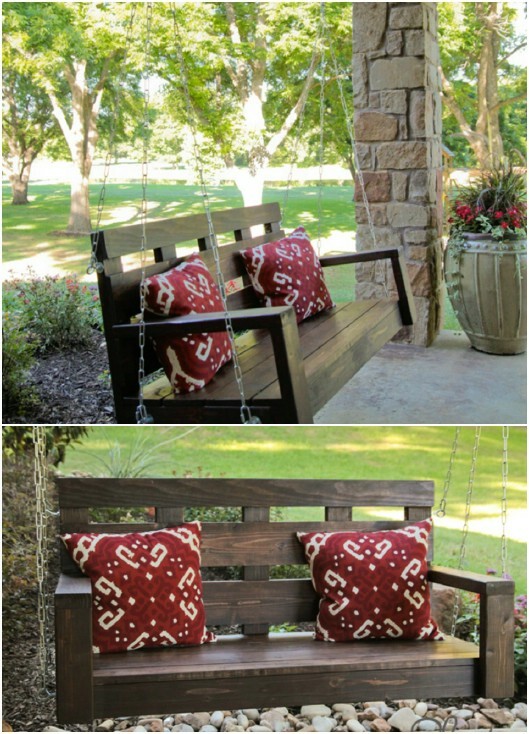 The better way is to make your own and this 2X4 porch swing is amazingly simple to build. You’ll just need a few 2X4s and some chains to hang it when you’re finished. Stain it, paint it white, or leave it plain. It looks just like those more expensive swings from home improvement stores but costs about ten times less. 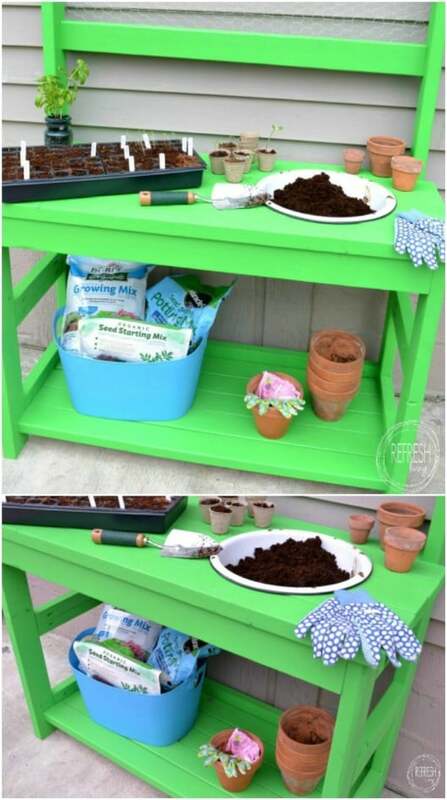 This potting bench is the perfect addition to your garden area and it’s a really easy build from those 2X4s. It has space for everything! If you’re an avid gardener then you need a sturdy bench to work up those seeds and prepare them for planting, right? This one is really sturdy and really cheap and easy to build. Plus, it just looks really good sitting next to the house or on the deck. 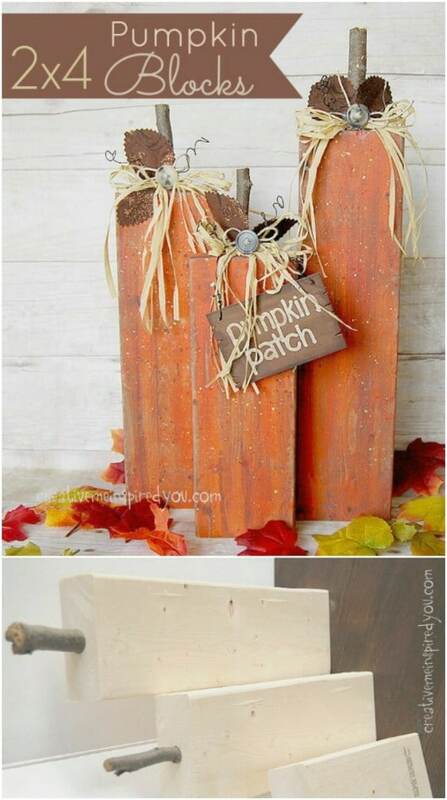 Before fall comes around, you just have to make this great pumpkin décor from those leftover 2X4 scraps. These look like decorations that you can get at Hobby Lobby and other similar stores, which typically run around $50 for the set. 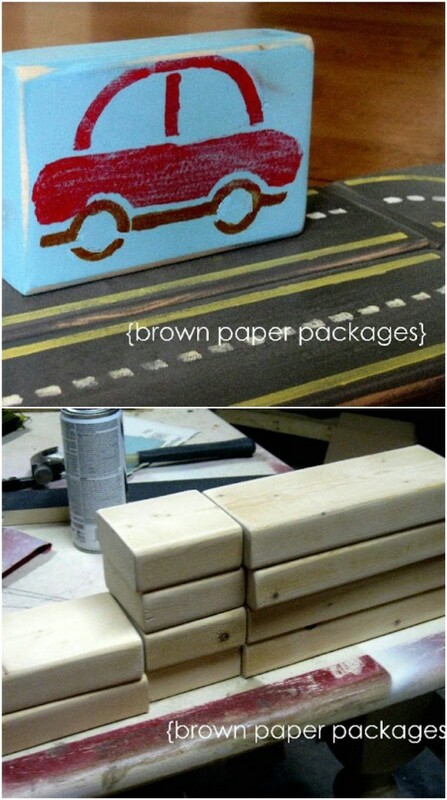 You can make them yourself for under $5 if you have the boards on hand. Just paint them orange and add your decorations. This is such a simple project and it gives you such lovely décor for fall. Any little one is going to love playing with these great DIY building blocks that you can easily make from 2X4s. You’ll need several pieces for the cars and tracks. Once you get them cut into the sizes that you want, you can use stencils to paint in the cars and track designs. These are so great and have such a wonderful rustic look and feel to them. This bench can be made from reclaimed wood that you’ve had left over from other projects. 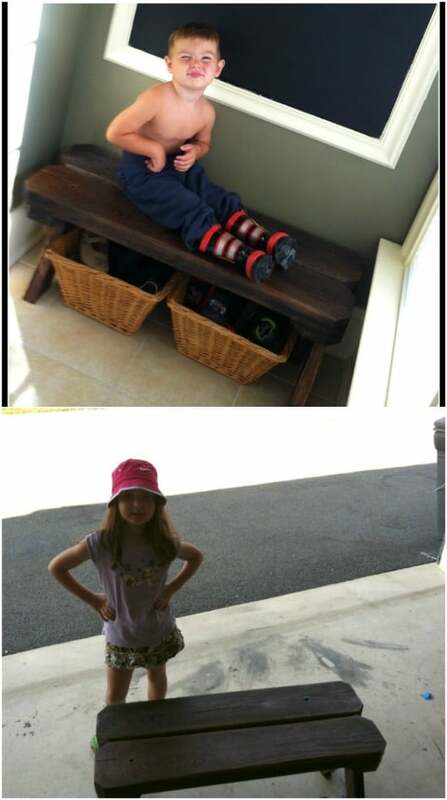 It’s a really simple bench to build and is perfect for the mudroom. If you don’t have a mudroom or room near the backdoor to put it, place it on the porch. It’s the perfect place it sit and take off muddy shoes and you can store baskets underneath for holding shoes or scarves and mittens when it’s cold outside. I love this lantern. It’s made from 2X4s and has such a wonderful rustic look to it. 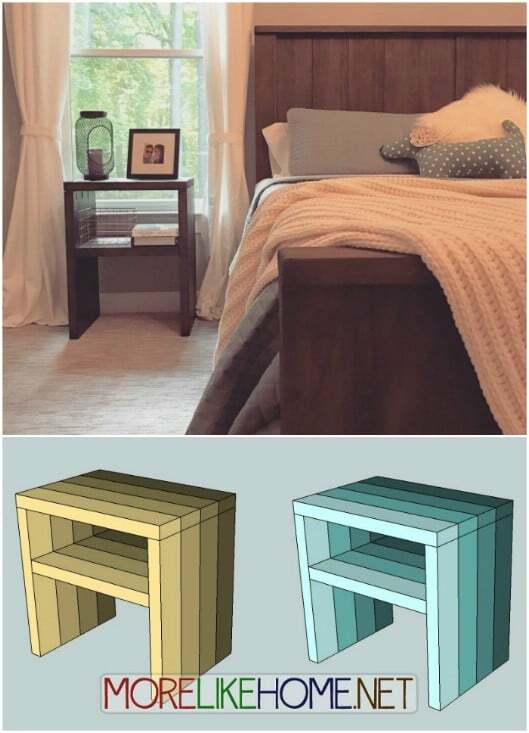 You piece it together with blocks from your 2X4s and it holds candles. It’s perfect for sitting on the porch any time of the year and you can really dress it up for the holiday season. 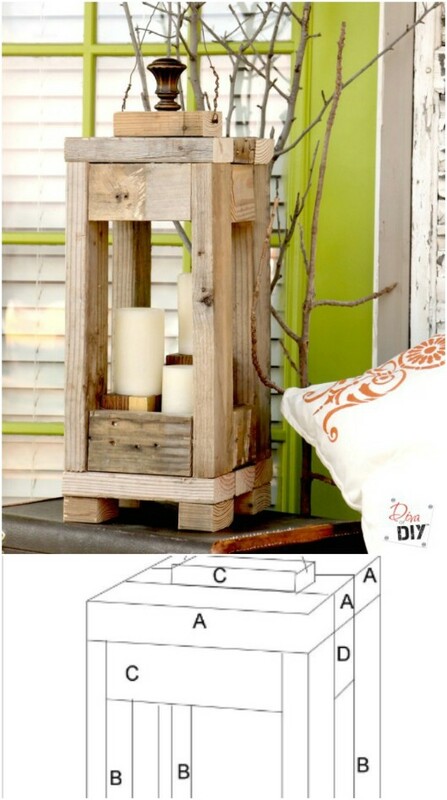 It resembles those old rustic metal lanterns and you can easily make it from leftover blocks of 2X4 – you know, those pieces you have on hand after you’ve done other 2X4 projects. These block bunnies that you build from 2X4s are perfect for Easter. They’re easy to make and such a whimsical way to dress up your spring décor. Just cut blocks from those 2X4s of different sizes, you can make an entire family of bunnies, and then paint them white with a little distressing and add your bunny ears and faces. They’re so easy to make and add such wonderful whimsy to your home. 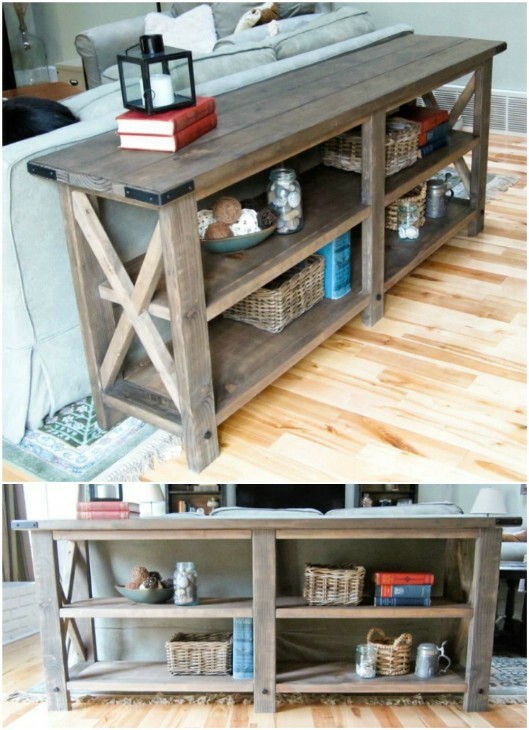 Put those 2X4s to great use by building this amazing farmhouse styled X console. If you need a console table, this is a great one to build. It’s pretty easy and you get that wonderful rustic country look. You can use reclaimed wood to give it a more distressed look or build it from new boards and just distress it yourself – or paint it white, whatever you want to match your existing decor. This coffee table is so unique and it’s really easy to build. 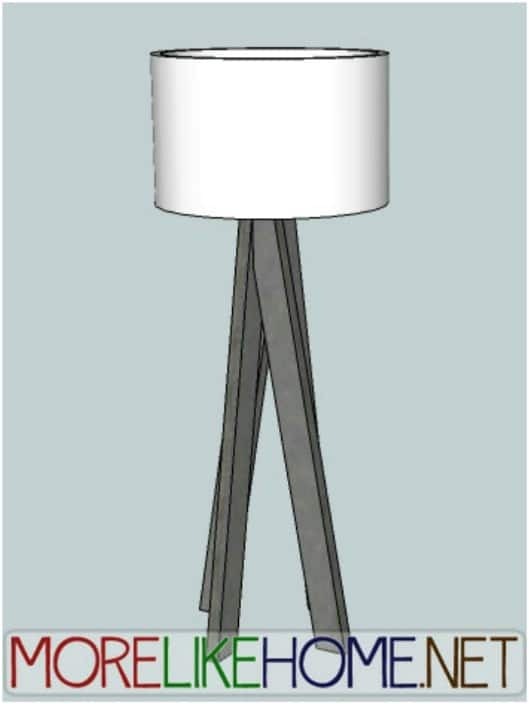 You’ll need a few 2X4s which you basically stack, toggled to create a beautiful design, on top of a metal leg base. I love the look of this one. It combines that great rustic look with a wonderful 1960’s look that is perfect for any living room. You could use the bench style legs or wooden legs – or even build the legs yourself from the leftover pieces of your boards. Christmas decorations can be so expensive, especially when you want something as unique as these little snowmen. You can build these yourself so easily. 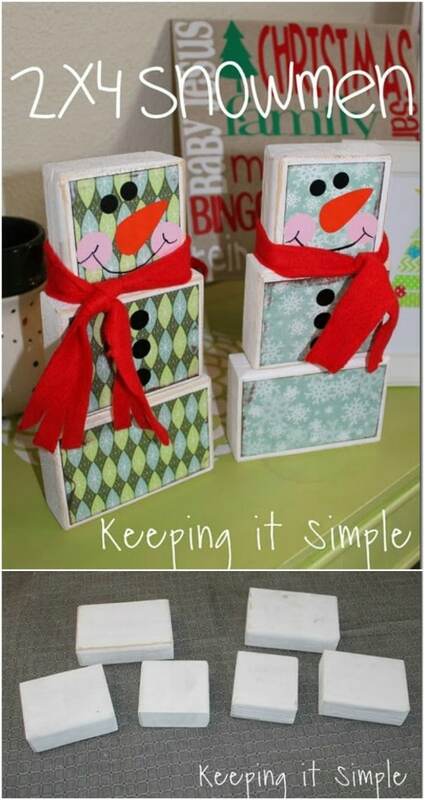 You’ll need blocks from those 2X4s – about three blocks for each snowman – and some paint and other decorations. 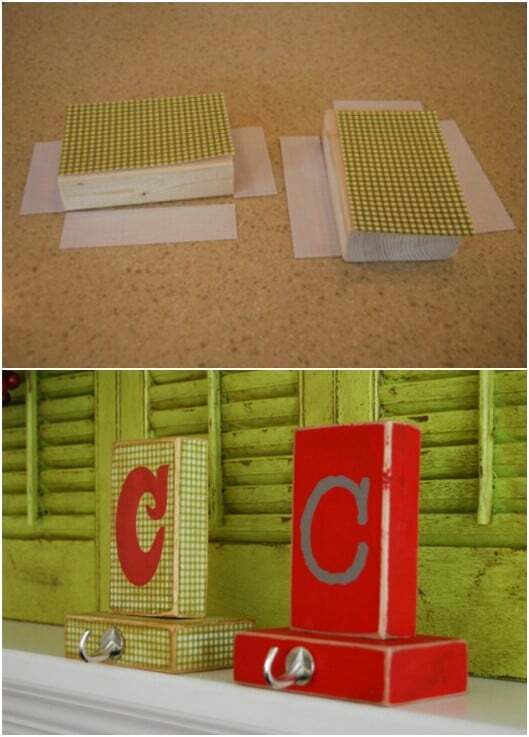 Just sand the blocks down and paint them white and then add scrapbooking paper with Mod Podge for the design. Then just add your faces and you’re all done. Turn those 2X4s into amazing gifts for your kids’ teachers. 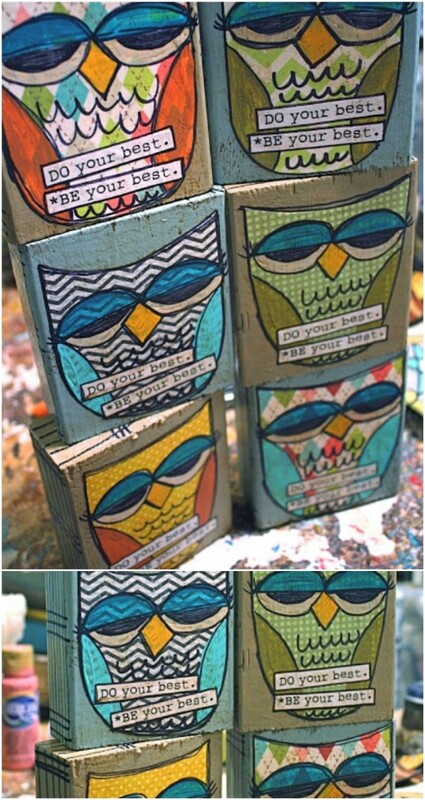 Just cut them into blocks, maybe add some design with scrapbooking paper and then a nice little quote fit for a teacher. These are so cute and since the boards cost less than $10 each – and you get about four blocks from each board – you’re getting a unique gift for teacher for less than $3 each! This wall art is amazing and will certainly draw attention from all of your guests. 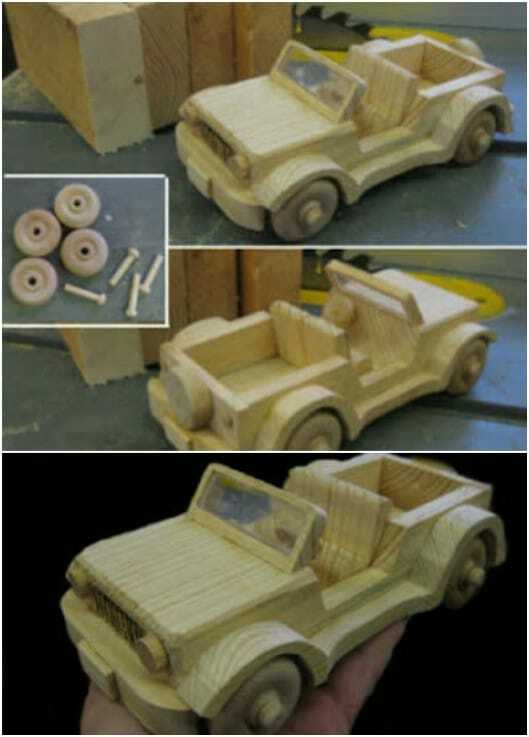 It’s made from 2X4 scraps and is pretty easy to build despite how complicated it looks. The board blocks are toggled to give it dimension and overall, it’s a stunning piece of art that you are sure to love hanging. You could stain or leave the blocks plain or even paint them different colors to add even more dimension. I love anything that has that great farmhouse style and this mirror is certainly no exception. It’s made from 2X4s and it’s pretty easy to build. You’ll need a mirror for the base of course and then a few 2X4s to build around the mirror. A dark stain would look beautiful but you can do whatever color or shade you need to match your décor. 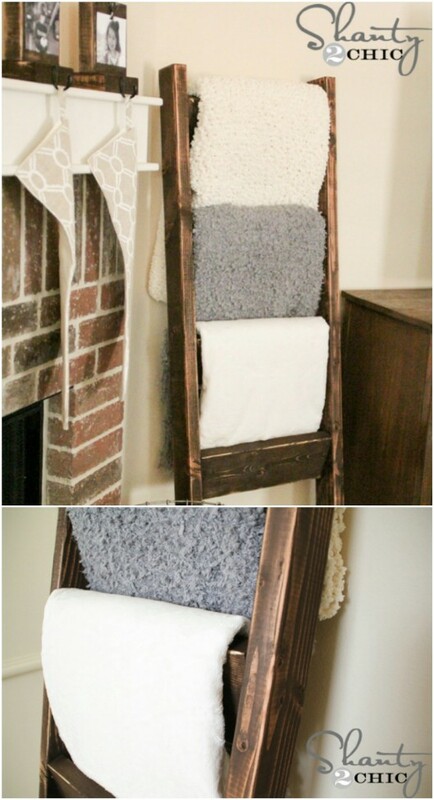 This would be perfect for a bathroom or you could even hang it in the mudroom and put hooks on the bottom for jackets. You can never have too much storage space and this little bench gives you loads. It’s made from those 2X4s and has a great X leg look. 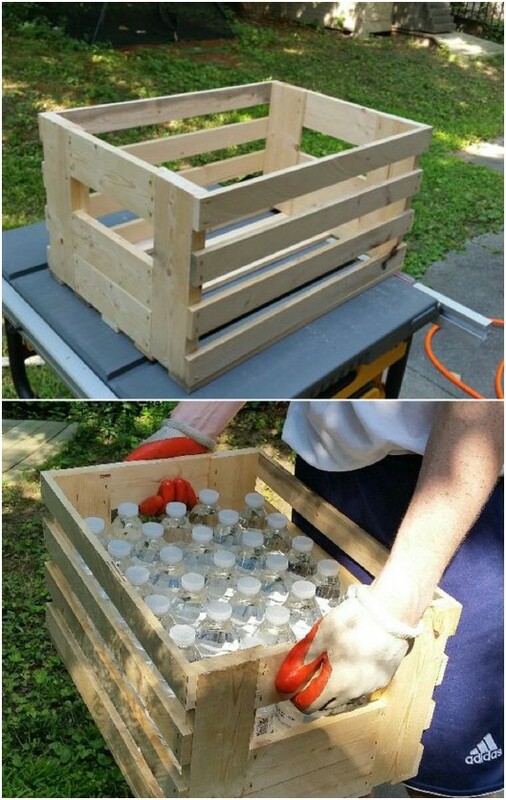 Underneath the seat are crates, which you can also make from your 2X4s, for storing just about anything you need to store. This would be a great outdoor bench for the patio. You can use the crates to store outside toys or even things that you need when you’re grilling out. 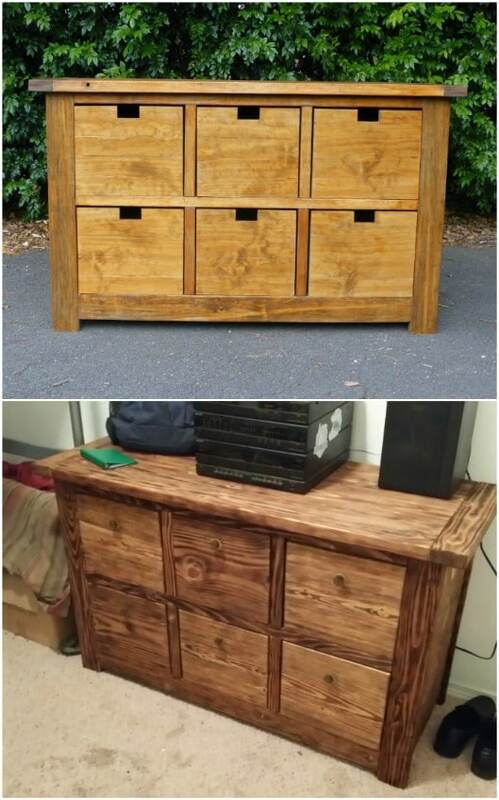 Best of all, you can build the entire thing, including stain, for around $40 or less. Here’s another great way to add some whimsical décor to your home and use up those 2X4 blocks at the same time. You can make them into penguins! These little guys are perfect for dressing up your home for the holidays and you can leave them out all winter long. You’ll need blocks of wood and then black and white paint to make the penguin design. 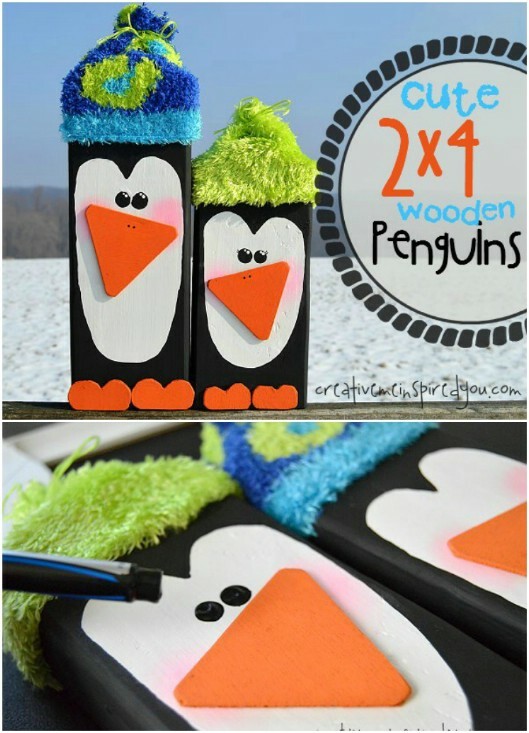 This is a great project for the kids to help with – they’ll have a blast creating their own little unique penguin. This wooden blanket ladder can be made for around $10 and it’s perfect for holding your smaller blankets. You could even put it in the bathroom and use it to hold extra towels. It has a wonderful farmhouse look and is so easy to build – you can have it completed in about an hour and it will only cost around $10 including the 2X4s that you need. If you have those boards on hand already, you can make this one for free. These ideas can also be useful to have decorative outdoors in sufficient time. Once again you have shared with us one more crazy & informative post with us. I have read many times your blog posts, here I got every time new & creative ideas. Waiting for your next post.